Is your family business thriving on the surface, but problems simmer below the surface? Maybe someone is driving the team painfully hard. Maybe people are doubting the productivity of a particular family member. Siblings may be consumed in a power struggle. Conflict doesn’t necessarily involve a brawl or shouting match. Conflict can center around misunderstandings or not feeling valued, differing viewpoints or longstanding disagreements. Of all businesses, family businesses are most prone to conflict, say researchers. Between the board of directors, suppliers, distributors, and bankers—plus professional managers, staff, employees, family leader, and family members—the many layers of influence and decision-making often add up to myriad potential points of conflict. As wealth managers, my colleagues and I have witnessed family businesses unravel over these types of conflicts. Resentments and disputes crack the foundation, and when nobody tackles the conflict directly, the workplace becomes full of subtle jabbing and passive-aggressive behavior that erodes trust, morale, and productivity. Whenever issues and conflict are left unspoken, over time they tend to worsen and cause real ruptures. As Josh Baron points out in Harvard Business Review, family businesses need to find the right level of conflict. Companies need ways to air grievances and concerns and to identify productive solutions that keep the organization moving forward. A Family Business Review survey of 59 successful family businesses found a competitive style of conflict management is less effective than collaboration, accommodation, and compromise. At the fictional Frontier American Breadwinner Corp, the founder’s nephew, Joe, runs daily operations. He says proudly, “I’ve worked hard for this company and its success.” The founder’s son, Bill, isn’t involved day-to-day, but focuses on long-term strategy and says proudly, “This is my dad’s business.” Neither values what the other brings to the table. Instead they pretend everything is fine. Pressure builds, spouses and relatives feel the trickle-down effect, and time together becomes a real strain. Nobody is screaming, but the tension is palpable. Without an open conversation about what’s going on—and soon—there will be a blow up that leads to a resignation. 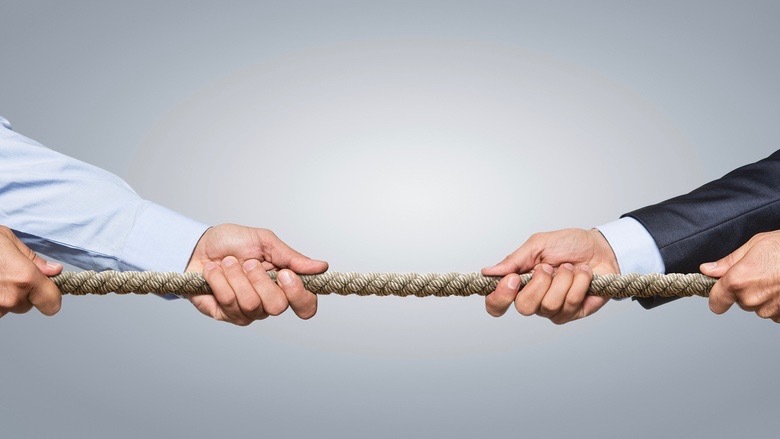 Researchers have discovered that conflict can be good for family business—if it is the right type of conflict. Conflict over tasks and processes can be beneficial, because the organization can harness the power of multiple perspectives to find better solutions. But relationship conflicts are not beneficial and need to be resolved first, before you can effectively solve disagreements over other topics. Signs of unhealthy conflict are frustration and defensiveness, where each person only see things from his own point of view or is unwilling to advocate for a solution. For example, maybe you know Bill isn’t good at sales, but you let him stay in that position. Then you criticize him at every turn and set him up to fail. Nothing in business is truly stable or finite, even though it can seem that way for a while. Market forces, operational challenges, and personnel issues can all shift the business environment and contribute to friction between family members. Value everyone’s perspective. Ask the introvert or the middle child who rarely speaks up, “Really, truly, what do you think?” Pull out thoughts from the people who don’t speak often, and you may be surprised at how valuable you find their insight. For example, a few years ago, one of my team members asked why, if work/life balance was listed as a core value, executives were sending emails in the middle of the night and working non-stop on weekends. Their raising the issue of this discrepancy made a lightbulb go off and helped my partners and me gain insight into a turnover problem. Step back and look at the big picture. One helpful approach is to take annual retreats or attend a getaway during which key players can focus on specific issues that can cause conflict. Don’t just put everyone together in a room; follow a set agenda. An outside facilitator can ensure everyone stays on task and feels heard. An outside advisor, such as a Balentine relationship manager, might be called in to provide an objective point of view. It’s tempting to avoid difficult conversations because you fear the stakes are too high. These people will always be your family, and you just can’t walk away from that connection. But silence can have a steep cost. Injuring a family relationship for monetary reasons, an inability to see the other side, or an unwillingness to have a difficult conversation can have heart-breaking implications. By promoting a culture of respectful listening, trust, and clear communication today, you’ll make it easier to get to the bottom of conflicts and resolve them.